1. Just go to “Settings” in your iOS device. 2. Select “General” -> “Keyboard” option. 3. 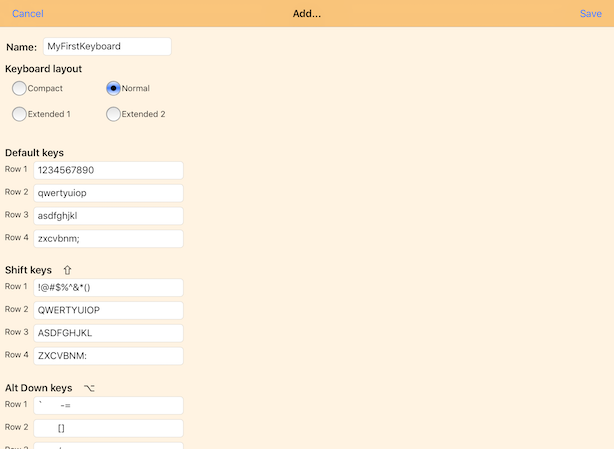 Select “Keyboards” (it will display a list of available keyboards). 4. Select “Add New Keyboard…” and press “FullKeys” keyboard option. 5. Now “FullKeys” should be listed. 6. Press Fullkeys again and activate “Allow Full Access” option. “Allow Full Access” option is required only to customize your keyboard from the application. FullKeys doesn’t connect to the Internet or does any action to get private information. 1. Hold "Shift" key for 2 seconds or drag out(or swipe out) the Shift key. The modifiers keys are Alt down( ), Alt up( ), and Shift keys( ). To lock those keys just swipe out the key. b. Change language of suggestions (these are the languages set in your iOS device in Settings -> General -> Language&Region). 4. Press the desired letter. b. It is used to change the functionality of <backspace> to <delete>, move cursor one letter to move one word. 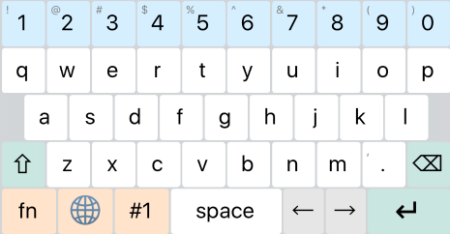 There are the 4 layouts supported in FullKeys, where the alphanumeric section can be customized. This size does not support Alt( , ) modifiers, only Shift( ). 2. 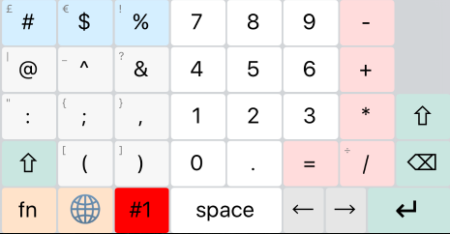 Tap on the blue arrow in the "Selected Keyboard" option. a. Type a new name to your keyboard. b. Change your keyboard layout. 5. Save your new keyboard settings. 6. Select from the keyboard list your new custom keyboard. 1. 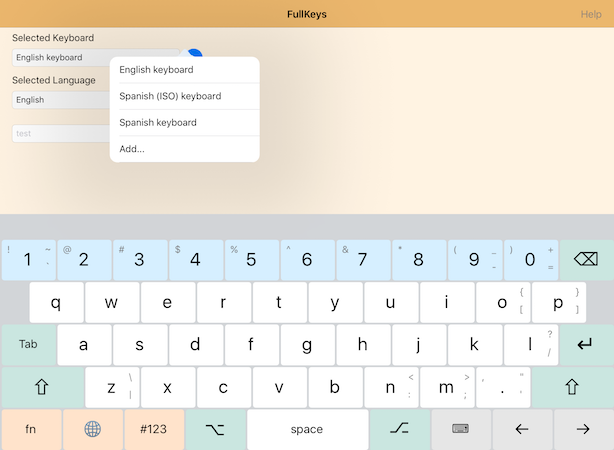 Select your custom keyboard in the FullKeys app. 2. Just swipe from right to the left and "Delete" option will appear.